Electronic visitor management systems are generally placed in the same category as other security systems – a cost centre. However, the benefits which can be derived from deploying an appropriate card/biometric reader and software far outweigh the initial investment cost. Powell Tronics has built a solid base of clients in the residential estate sector, with a number of premier estates around the country currently successfully operating its access control and visitor management solutions. For the fourth consecutive year, the company participated in the Hi-Tech Security Solutions’ Residential Estate Security Conference as a premier sponsor. John Powell, CEO of Powell Tronics, says that the event provides the company with an unrivalled opportunity to specifically address one of its major target audiences in a one-on-one environment. 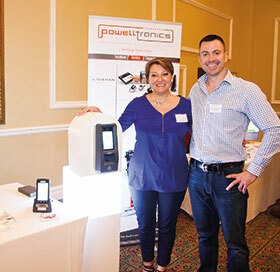 This year’s event saw Powell Tronics promoting the use of its in-house developed PT-Guest visitor management software. According to Powell, PT-Guest caters for the pre-authorisation of visitors to an estate with a link back to a specific resident. “When it is used together with a licence disc scanner, we can ensure that accurate information is captured when a visitor arrives onsite. No longer will the infamous ‘M Mouse’ be scribbled in a traditional visitor book when a guest visits. The system doesn’t stop there though, as it then ties in a visitor request to the fully integrated access control system. Full details of the visitor’s transactions are then provided via a web-based reporting system for analysis after the visitor has left,” Powell explains. Powell continues that the company can also offer a scaled-down version in the form of PT-Scan. This Powell Tronics-developed software offers a simple interface that replaces the traditional visitor book with a small hand-held scanner that also provides a host of web-based reports. Powell Tronics also used the event to underline the advantages of the new MorphoAccess SIGMA Extreme terminal. “The MorphoAccess SIGMA Extreme is more rugged and durable than any of the readers Morpho has previously released. It has an IK09 rating which means that the device is protected against 10 joules impact, or the equivalent impact of a 5 kg mass dropped from 200 mm above the impacted surface,” says Powell. Powell Tronics adopts a customised application philosophy that entails consultation with installers and end users to determine the best hardware and software for their specific access control and visitor management requirements. For more information contact Powell Tronics, 0861 787 2537, marketing@powelltronics.com, www.p-tron.com.